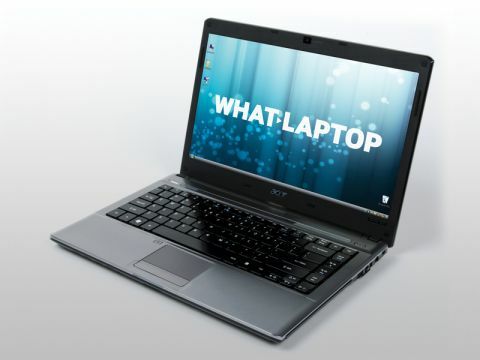 Acer's Aspire Timeline series comprises quality and highly portable machines aimed at corporate users. The Aspire Timeline 4810T (£749 inc. VAT) is the first model we've seen from the range and features a 14-inch widescreen display. In a bid to position the brand at the desirable end of the laptop market, you'll find aluminium used in the construction – such as the lid – and a thin, commuter-friendly chassis. From the outside, it's a smart-looking laptop, although the grey plastics used inside are slightly more conservative. Quality is one of the most impressive aspects of this machine. The plastics are all highly robust and it's more than strong enough for the daily use. The 14-inch LED screen is ideally suited to movie playback, mainly because of the 16:9 widescreen aspect ratio, but also because of the crisp image quality and faithful colour reproduction. The glossy Super-TFT coating is highly reflective in the brightest of conditions, however. Graphics are handled by an integrated Intel GMA 4500M GPU, providing moderate power for tasks such as photo editing or web browsing. You'll be able to carry out light video editing, but look elsewhere to carry out more demanding graphics tasks. The keyboard features an unusual layout, with flat keys raised high above the main board. It feels incredibly well made, with no sign of flex or unwanted movement, but it's not at all practical. The completely flat typing surface means it's difficult to distinguish between the keys when touch-typing, so mistakes are a common occurrence. Due to the thin chassis – which measures 31mm at its thickest point – Acer has opted to use Intel's SU9400 low voltage Core 2 Duo processor in order to keep things cool. It runs at 1.4GHz, but with 3072MB of DDR3 memory in place, we found performance was surprisingly smooth with little lag during day-to-day use. The choice of processor also has a positive effect when it comes to battery life, giving an impressive 484 minutes between charges. You'll find a full complement of features onboard, including a neatly integrated DVD rewriter. It can be opened by a button on the top of the chassis, which is another nice touch. Ports comprise three USB ports for adding peripherals, and an HDMI port for connecting to high-definition (HD) displays. You'll also find an analogue VGA port for older screens and projectors. If you're in the market for a semi-portable business machine, then the Timeline 4810T is worth a look. Its robust build quality and functional design may be practical rather than desirable, but the tremendous all-day battery makes it a good choice for the mobile worker.